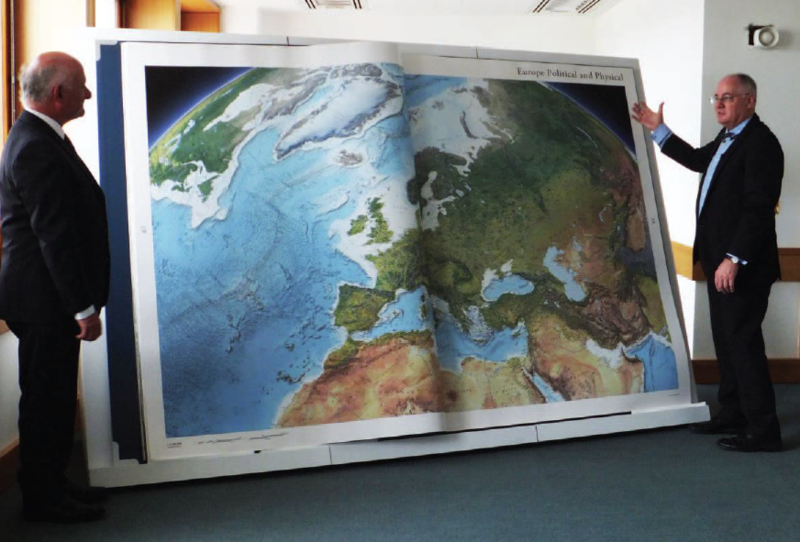 Earth is the world's largest Atlas, with each page measuring 6ft high x 4.5ft wide. Maps were compiled automatically in a GIS, followed with editing by Cartographers to correct names, linework, positioning etc. Editing work was performed in Adobe Illustrator with the Cartographer working from marked-up sheet maps (full size) or PDF files. The overall winner of the International Map Industry Association (IMIA) regional map awards for 2013 was the Millennium House Australia entry Earth Platinum World Atlas published by Gordon Cheers. This magnificent Atlas is truly amazing standing 6 feet high x 9 feet wide when opened. Over 60 cartographers from around the world worked on this fantastic atlas, with many IMIA member cartographers involved.